Ballpark food often plays a central role in the memory-making, but dining at the game doesn’t have to kill your wallet (or your diet). Check out the breakdown from NY Magazine on the “ugly truth about stadium food.” I’m all for breaking the rules now and again, but those calories should scare you. Many stadiums allow patrons to bring their own food these days, so check out your home-team’s website to find out what to bring and what to leave at home. You can enjoy all the traditions of the game and still feel good about what you’re doing to your body! If hot dogs are your party, try Aidells brand organic chicken-apple sausages or Applegate Farms organic spinach and feta sausages with fresh-baked buns. Throw them in a saucepan with olive oil, finely chopped sweet onions, and some black-strap molasses and saute until completely cooked. Wrap up bun and dog in tin foil, or save the buns on the side and make your own at the game. Between the dogs and buns, you’ll spend a little over $10 for 4 people, what can you find for less than $3 at the park? Skip the nachos, and pack your own chips and homemade guacamole or hummus. Apples are easy to pack, and perfectly crisp on a hot day too. Be bold: pack a bangin’ salad like panzanella or this Mediterranean variety. You might get a funny look or two (speaking from experience), but deep down, they’re wishing they were your friend. I promise. Ice cream, unfortunately, would be quite a challenge to pack. Bake cookies ahead or make your own Cracker Jacks in less than 10 minutes at home. 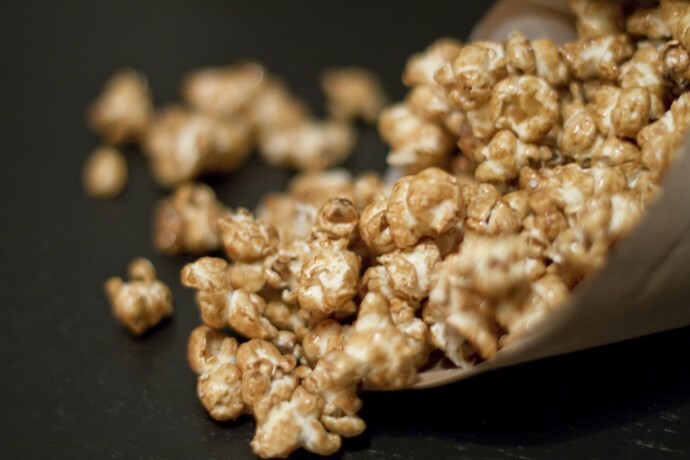 So easy it’s a sin to even call it a recipe, try this caramel-like popcorn and you’ll never go store-bought again. Kelsey Brown writes about healthy hearts, minds and bodies for Small Kitchen College and Happyolks. She’s a Giants fan by blood, Padres fan by GPS, but a Rockies fan by heart. In a large pot, add olive oil with 2 popcorn kernels over medium heat and cover. Wait until you hear at least one kernel pop, and add the rest. Using two oven mitts, shake the pot with the top on over the heat source to coat in oil. Allow to sit for a few seconds, then toss. Repeat. You will begin to hear the remaining kernels start to expand. Reduce heat, and continue until the rate of popping slows. Remove the lid, sprinkle in brown brown sugar and stir with a wooden spoon to coat. The pot should be warm enough to melt the sugar onto the corn, then harden. Sprinkle with salt, cool, and package for the game!